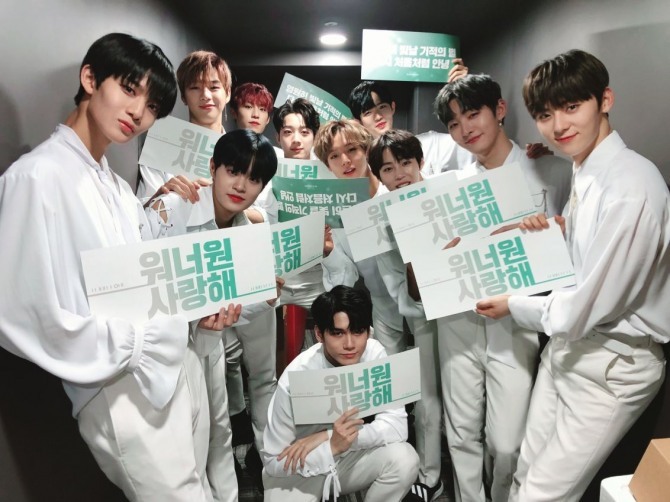 A rare online auction started noon Monday to purchase the copyright of K-pop boy band Wanna One’s hit track “Beautiful.” As of 5:00 p.m., more than 2,800 bidders were joining the auction for 3,000 “pieces” of the copyright, with the bidding price soaring fast from 25,000 won ($22.39) to 150,000 won apiece. 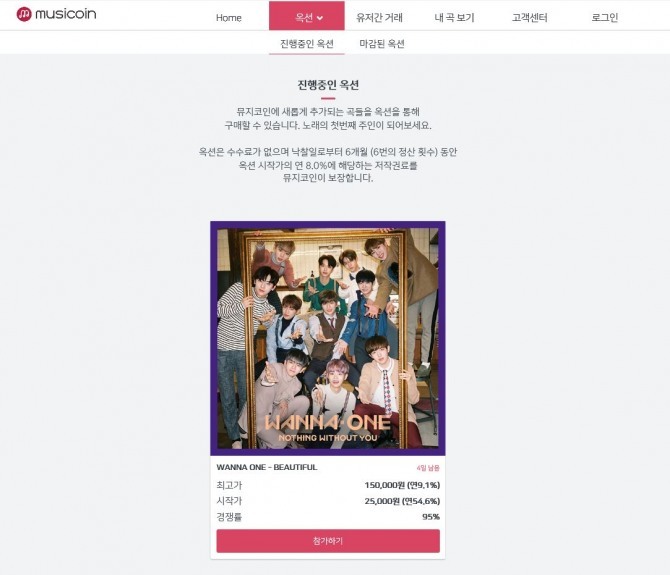 “The copyright pieces have become a new type of ‘fan goods’ for the idol admirers,” Jung Hyung-kyung, CEO of Musicoin Investment, the auction platform operator, told Kpop Herald in a recent interview. Musicoin, established in 2017, buys partial or full rights to artists’ work -- the firm declined to reveal what portion it usually buys -- and then divides the copyright up, before putting the pieces up for auction. The platform allows users to purchase the ownership and the purchased pieces can be traded between users as well. The starting price is based on the price valued by Korea Music Copyright Association, the business lobby that manages Korean music industry copyrights. The firm said it guarantees a minimum 8 percent annual return rate in the first six months. After that, the copyright is maintained until 70 years after the original artist is deceased. A total of 140 songs have been auctioned since the platform launch. Of them, the most profitable is first-generation K-pop idol g.o.d’s “Sky Blue Promise” whose copyright value soared 1,444 percent since the auction, while the most expensive song was SHINee’s “Wish Upon A Star,” which sold at 255,000 won per piece. “Idol songs usually start at higher prices due to fans competing fervently to get hold of the pieces. But actually it is steady-sellers, mostly ballad songs that gain more value over a long period of time, as they are more widely enjoyed,” the CEO said. Jung who also writes some hit K-pop songs came up with the idea of a copyright auction to share more profits with artists, especially on their lesser-known songs that need to be re-evaluated. For example, three songs by singer Ailee were put up for auction with similar starting prices and it was the least popular, “Evening Sky,” that boasted the highest return later. For now, only Koreans can purchase the copyrights within the platform but the firm plans to launch foreign services in the coming months due to surging demands, especially from Japan where music fans prefer to own downloaded songs rather than streaming.